Helical DS Series Double Start Flexible Beam Couplings are designed for today's high performance motion control systems. Helical DS Series Double Start Flexible Beam Couplings incorporate two helical beams (double start) in each of two separate HELI-CAL® Flexures (double flexure), combining greater end-to-end rotational accuracy with radial flexibility in one design. Helical DS Series Double Start Flexible Beam Couplings are perfect for high speed motion control systems, where fast response time is important. E.g., lead and ball screws, encoders/ resolvers and anywhere high torsional stiffness is required. Helical DS Series Double Start Flexible Beam Couplings are available only with integral clamp attachments. 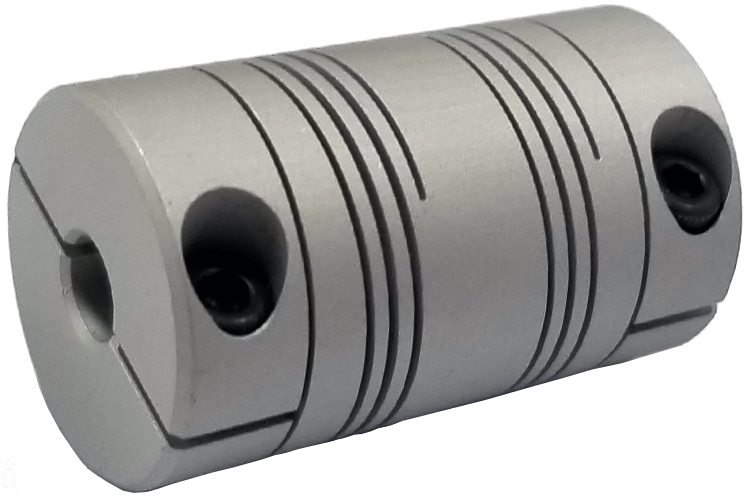 Helical DS Series Double Start Flexible Beam Couplings provide the high torsional stiffness and low inertia necessary for positioning devices, servo motors and lead screws. Helical DS Series Double Start Flexible Beam Couplings also provide you with substantial .010-inch parallel offset capability, reducing the need for high-precision alignment during assembly operations. It's your ticket to greater system accuracy and reliability. A1 Seating Torque (numeric): 10lb/in. A1 Center Line (Metric): .12in. A2 Seating Torque (numeric): 10lb/in. A2 Center Line (Metric): .12in. Torsional Rate (deg/Nm): 0.40 degree/lb in. The Helical DSAC075-8-6 Double Start Flexible Beam Coupling, DS Series is one of thousands of quality tooling products available from MRO Tools. Please browse Helical Double Start Flexible Beam Couplings, DS Series for tools similar to the Helical DSAC075-8-6 Double Start Flexible Beam Coupling, DS Series. Helical DSAC075-8-6 Double Start Flexible Beam Coupling, DS Series description summary: Helical Double Start Flexible Beam Couplings, DS Series. Outside Diameter: 0.75'' Length: 1.25'' Major Bore Diameter: 0.250'' Minor Bore Diameter: 0.188'' Momentary Dynamic Torque: 12 lb/in. Angular Misalignment: 3 deg Parallel Offset: .010'' Quantity discounts may be available for the Helical DSAC075-8-6 Double Start Flexible Beam Coupling, DS Series. Please contact MRO Tools for details.